It’s no wonder that a survey by the National Association of Home Builders showed that “more than 70% of buyers want an island in their kitchen, and of those, 50% consider it a must-have.” Kitchen islands are functional, stylish and versatile. Since it’s obvious that adding an island is a sound investment, we’ve put together 55 of our favorite kitchen island ideas to use for inspiration. Want to save money, while providing a beautiful, yet practical kitchen island? Create more counter space with an upcycled antique desk. Add some wooden planks on top of the stretchers to create even more space with a bottom shelf. Another great way to grab an affordable kitchen island is to buy a commercial stainless steel worktable. This is a fairly inexpensive option that comes in a variety of sizes maximizing the potential of any sized space. Plus they’re often lightweight enough to move without wheels. Just because a kitchen island is functional doesn’t mean it can’t be cute. When thinking about which types of countertop to go with don’t overlook small details like trim. Designer Krista Ewart used scalloped shapes on the edge of her island, adding a charming vintage element to the island and matching the ceiling. Painting one side of your island with chalkboard paint allows for fluid creativity, an inspiring quote one day or just the week’s menu the next. Another way to customize your island, and make it user friendly for everyone is to add a pull out bottom drawer with custom bowl inserts. This allows for easy feeding of your pets and ensures they won’t get into their food when they aren’t supposed to. If you don’t have space for a full fledged island use a floating island for a gorgeous look that still adds extra counter space. Use a simple butcher-block ledge to serve as a kitchen island or create an enclosure with a minimalist island design like the one in this picture. The designers at Unique Space Interiors managed to incorporate an island into a not so spacious kitchen by picking just one use, a gas top burner, which leaves the perimeter counters free. The painted motif adds style to an otherwise simple island. A smart way to add extra counter space to an island in a kitchen with less room is to add a drop leaf. Pop it up when needed and drop it down when you’re done. The drop leaf can serve as an eating nook or extra prep area that can be stored when not in use. Turning an island into a peninsula by attaching one side of the island to the wall is a great way to gain space and define the flow of kitchen traffic. Peninsulas will often provide more circulation and even seating space; just add a stool at the end of the counter. Bonus tip: to give the peninsula that island feel attach it to a wall without any cabinets. For even more functionality don’t forget to include electrical outlets within your island. These outlets can be hidden behind drop-down drawer fronts or even made to pop out of your counter; adding storage for cell phone chargers and other electronics keeping them behind closed doors and off the counters. Kitchen islands are perfect for all types of extra storage. Add a built in knife block or pull out cupboard specifically to hide your garbage can. A custom drawer insert fitted, as a spice rack is another great way to save space in the kitchen and makes all your spices easy to spot. Adding column-style corners on your kitchen island can be more than just decorative. Columns combined with recessed panels and push latch technology open to reveal hidden cookbook storage. Kitchen islands aren’t just great for storage within in the island, but once you install it don’t forget to maximize the space above. Add suspended storage to display a matching pots and pans collection or beautiful stemware. If you’ve decided to install a stovetop with overhead venting then use this space for the range hood. A horseshoe-shaped island with extra seating and large counter top provides a great view of the prep area, allowing the cook to interact with guests while preparing the meal over at the second island, which houses an oven and large work counter. Both islands play off each other to include practicality, functionality and design. If your kitchen is small consider a circular or oval shaped island. A round island can do wonders for utilizing small spaces and directing the flow of kitchen traffic. Plus it gives added uniqueness by breaking away from a traditional rectangular island. Making sure your island fits comfortably within the confines of your kitchen, and has enough clearance on all sides is an essential consideration. Placing your island on a diagonal is a great way to work with your kitchen space while still ensuring the island feels centered and creates equilibrium across the room. Ditch the dining room table and go with an over sized island instead. With an extra large island, you can add seating on two sides and have enough seating for the whole family. It’s also a great way to create a comfortable atmosphere in an open floor plan. Making it practical, yet eye catching, is a key component of the kitchen island. So if you’re looking for your kitchen to be the hub of the household, warm and inviting for friends and family, why not take seating to the next level with a built in island sofa. Entertain guests by turning your kitchen island into a home bar. Transform your island with swivel bar stools, built in wine fridges or wine bottle holders mounted on the side. A built in island bar can be customized for any kitchen and make it a cozier space with room for friends and family to share a bottle of wine. Another advantage to the breakfast bar concept is that it can be useful to hide kitchen messes. Keep unwanted clutter out of sight by raising up the breakfast bar several inches past the island counter, blocking the view of unsightly dishes in the sink or appliances. Beth Laughlin of Laughlin Designs has noticed a "huge trend toward secondary cooking stations." Islands are easily converted into these types of work stations by adding an extra sink or stove top. Perfect for a communal setup where guests can partake in the cooking. Mixing finishes can add texture and style to any kitchen while helping you stay on budget. Love a costly specialty finish? Use it as an accent to capture the feel without breaking the bank. For example, a painted finish on the perimeter and a stained wood on the island sets a traditional tone that still looks stunning. Kitchen islands can add style to any home. Using a different material or color for the island counters than what you used for the rest of the kitchen is a great way to create contrast. For example, use a black or a dark stained wood for the island while the rest of your regular countertops are white quartz. Kitchen islands made from logs or natural granite with no touch ups make for unique islands with a raw, organic look. These aren’t just wood boxes in the center of the space but a functional addition that will enhance the overall design. A kitchen island is a great way to make space for a recycling bin and compost bin. Plus veggies like onions, potatoes, and squash do best when stored in a cool, dry place. Store them in your island using pullout wire baskets underneath standard drawers. Lighting is important when it comes to food prep but that doesn’t mean you can’t have fun with functional lighting. Check out this DIY LED kitchen island that offers the added benefit of ambient and cool lighting. Bookshelves and dressers also make for great kitchen islands. If you’re on a budget or just love DIY these are great options for any kitchen. A bookshelf or dresser already comes with built in storage, just add butcher block or a marble counter top and voila, a stunning and useful kitchen island. Using a regular butcher block is a perfect alternative for a kitchen island. Butcher block comes ready for heavy kitchen use and you can usually add a few stools to create a snack counter. Try choosing bright colored stools for an extra pop to your makeshift island. For a vintage kitchen feel start with a wood island and use a whitewash to give the wood a weathered, antique look. Paint it a pale color, and pair it with a light wood countertop to give it that vintage vibe. Vintage-inspired knobs and handles can give the island a finished look. Add retro bar stools made from solid, bright-hued fabrics or a vintage-inspired pattern. By placing certain amenities low down on your island, like a microwave or refrigerated drawer, kids can easily help themselves to an afternoon snack or early weekend breakfast. This can help make kids feel independent while still being in close eye view. For younger kids consider adding a magnet board to create a children’s play space or use the chalkboard paint mentioned above. Literally, if you don’t want a traditional boxy kitchen island there’s plenty of creative ways to get that extra storage and seating. For example, theSullivanWorkshop on Etsy transformed a vintage factory styled industrial cart into an amazing island; and ThePianoGal, also on Etsy, converted a 1976 Yamaha piano into a breakfast bar; making these islands the ultimate kitchen conversation piece. In this 400 square foot apartment every inch counted, but there was no need for sacrifice. A sculptural console style wood table acts as a three-in-one table island and workspace. Induction hobs are becoming more competitively priced due to increased popularity. These work wonders for kitchen island design and are a perfect choice for families because there’s no risk of injury since they don’t get hot. Similarly pop-up extractors retract when not in use keeping your kitchen island sleek and clear. A lazy Susan on the kitchen island makes entertaining easy and keeps treats within reach. You can add a lazy susan to a stationary island or make the whole thing mobile by keeping it circular and adding wheels, ideal for a small space. If your space is extra small you might want to make the island itself, storable. You can do this by customizing the island to fit under a counter top, thus easily rolling it out when you need extra workspace or rolling it back under when you need extra living space. Make use of corner storage by adding a bookshelf on the wall at the end of the island. Don’t sacrifice storage in a small space; use an island to capitalize on often overlooked spots. With added electronic outlets a kitchen island can also double as a great office space. An island workspace allows you the option to work seated or standing. Simply plug in your laptop and pull up chair (or don’t). Creating an office space in the hub of the home also allows a busy parent to keep an eye on their kids while getting work done. Using door fronts that look like decorative panels creates seamless storage, keeping your island sleek without sacrificing space. Use a magnetic push latch to achieve this look and the possibilities are endless; a magnet board on one side, an icemaker on the other, or just a regular cupboard space to store pots and pans. Use your kitchen island for both storage and display to maximize kitchen island potential. Mix open and closed storage by designing an island with both closed-door cupboards and open shelves. Use the shelves to display pretty items and the closed doors to house everyday cookware. If your kitchen has the extra room adding a low rolling kitchen island can be a fun and handy addition. This feature allows you to instantly slide out a bit of extra counter space and can be a real asset for food prep or working with children. U shaped islands provide three walls of cabinetry and appliances, enough to increase the efficiency of any kitchen. These islands are both highly functional and incredibly spacious. U-shaped islands are perhaps the largest and most accommodating giving extra storage space and ample workspace. If you have a large enough space why sacrifice storage for seating or vise versa? Create an L shaped island that combines the two. One part of your island has under the counter storage while the other part of the L is left open for extra seating and ample leg room. Islands are a perfect way to add more chairs for large family gatherings. Choose an extendable feature or incorporate a table/desk into the design. Islands can be a combination between aesthetics and utility with eye-catching shapes and designs that still allow for practicality when entertaining large groups. If you love the idea of a built in sofa but don’t have that much space opt for a built in banquette instead. A three-in-one island combining the banquette with prep station with and glass-front display cabinet saves on space but doesn’t sacrifice function or comfort. Add a 12- to 16-inch countertop overhang spacious enough to provide legroom and space for place settings and meals. 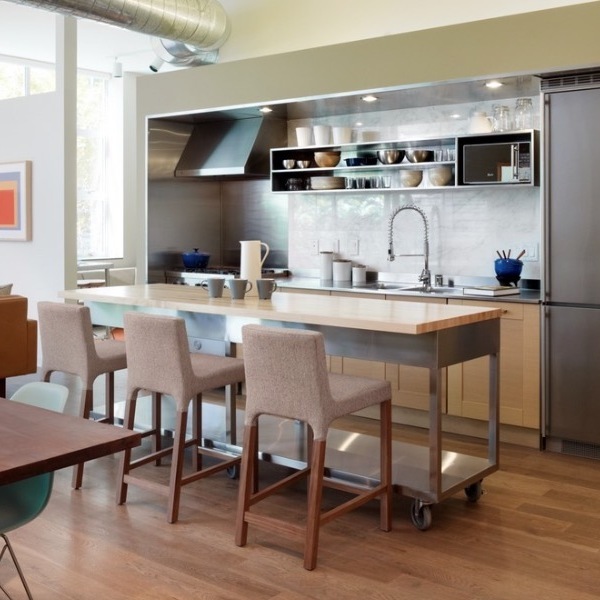 An island turned breakfast bar will fulfill any cooks dream by transforming it into a space, that allows the cook to stay included in the conversation, request help with prep work or even help with homework. Use your kitchen island to neatly tuck away appliances. The dishwasher, microwave, warming drawer, garbage disposal, and beverage center are all appliances that can be fitted into an island. This minimizes what is seen at eye level and keeps the focus on the character of the island itself. Need a change that’s fast and inexpensive? Using a bold print wallpaper to cover your island is a quick and easy fix that will brighten up any room. Adding geometrics or large print to your kitchen island is a great way to shake things up and won’t make a small room look even smaller. A kitchen island can be a great way to add subtle color. Just a hint of bright blue on the island shelves or a rich green on the island drawers can add lots of charm and joy to the kitchen. Kitchen islands can be works of art, and what better way to incorporate art into your house than by painting a mural or fun mosaic on the end cap of the island? Use this piece of art to pull all your kitchen elements together. Don’t relegate the island to the inside; plenty of outdoor kitchen islands come pre-built with a complete barbecue station that includes a grill, prep space and stovetop cooking area. Cabinets and storage areas are also usually a part of these designs making it practical inside and out. Work your island into a support beam so you don’t have to sacrifice style over safety. Support beams can act as an anchor or pivot point to which your built-in furniture, like a kitchen island, can gravitate. Adding a second column can create symmetry and even frame the stove wall. Guests love to gather in the kitchen so why not turn your island into a party central gathering area? A butcher-block topped island can easily be sanitized and turned into a charceuterie board, or set up a self serve bar with wine glasses and finger foods. As the famous saying goes, “no man is an island,” but we hope these 55 great kitchen island ideas have convinced you why every man needs one in their home. From utilitarian or artsy, to inexpensive or all out, kitchen islands can suit every need, and we hope you’ve found inspiration in these 55 great ideas. Every home can use backup energy sources. 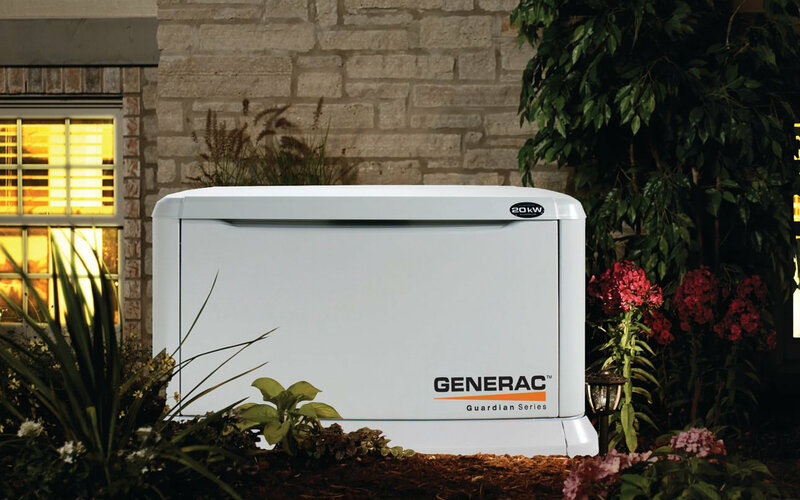 We put together our research for a best generator buying guide for those in the market for one.